Counting is a universal language, but it can become an addiction when you have an intense fear of weight gain. You count your calories, the hundreds of laxatives you’ve taken in a week, and the number on the scale dictates whether or not you feel worthy enough to eat. Eating disorders have the highest mortality rate of any mental illness, however, if those suffering get the appropriate treatment within a reasonable time it’s treatable. The longer an eating disorder goes untreated, the more advanced it is likely to become and the more difficult it will be to treat. Reel Stories. 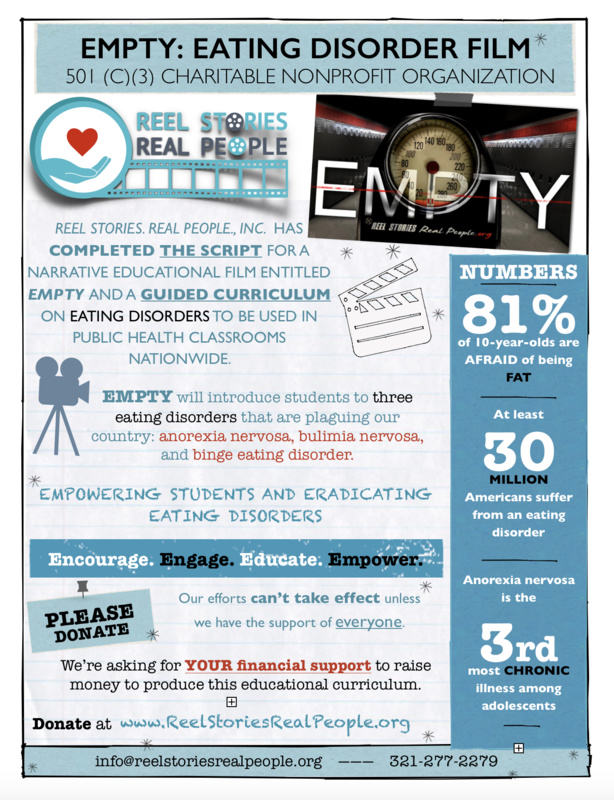 Real People., Inc., a 501 (c) (3) charitable nonprofit organization, has completed the script for a narrative educational film andguided curriculum on eating disorders to be used in public health classrooms nationwide. This film entitled Empty, along with the guided curriculum, will be provided free-of-charge to institutes of higher education. 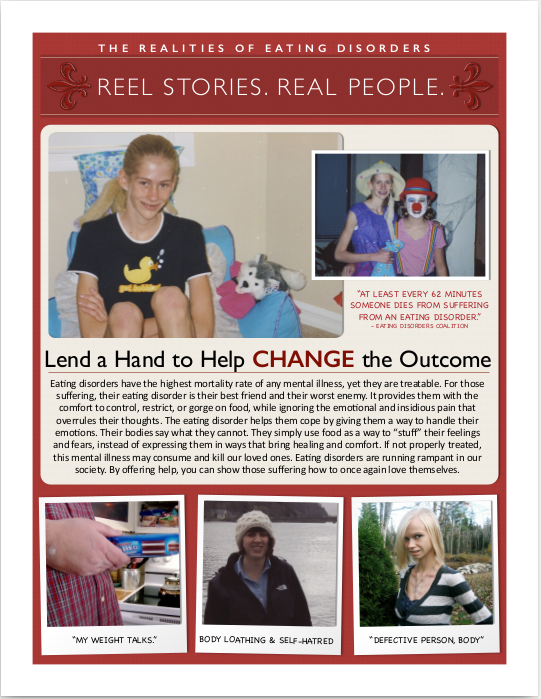 Prevention programs like the one created by Reel Stories. Real People., Inc., can reach a student before the full-blown onset of symptoms. The enhancement resources also provide students with positive reinforcement to encourage them to improve their overall thoughts on their body. Our school-based prevention program will highlight the prevalence of eating disorders within the adolescent population. In addition, the film and curriculum will emphasize some of the reasons why these disorders arise in individuals and why there is a cause for concern. Furthermore, this curriculum will analyze the populations affected by these disorders and will shed light on the biological, psychological, and sociological features of the individuals affected and the influence of social media on body image. Learning never ends. A film about eating disorders will expose people to a topic that’s typically taboo. There’s a stigma attached to mental illness, however, the only way to fight this belief is to educate with valuable knowledge. Research shows at least 30 million Americans suffer from an eating disorder (Hudson, J.I., Hiripi, E., Pope, H.G., & Kessler, R.C., 2007). Unfortunately, every single day, at least 23 people will die as a direct result of this mental illness. That’s more than two-dozen families each day planning funeral arrangements because their loved one lost their battle against this insidious illness. Our mission started with the desire to tell educational stories, and that mission would remain incomplete until we could use storytelling to broaden the discussion surrounding mental health. Most textbooks don’t go into depth about the debilitating illness. In order to address this issue, we undertook the writing of a narrative film and guided curriculum to be used in public health classrooms nationwide. This educational film will introduce students to three eating disorders that are plaguing our country: anorexia nervosa, bulimia nervosa, and binge eating disorder. 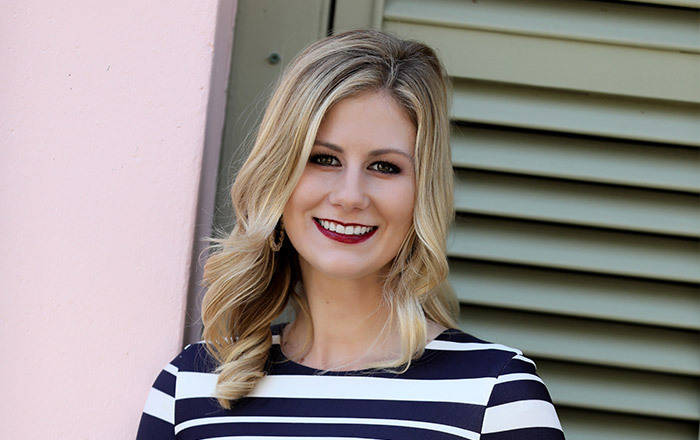 The narrative film, and the guided curriculum portion of the project provides schools with a lesson plan that will aid teachers in their discussions with students regarding eating disorders. These enhancement tools will highlight the prevalence of eating disorders within the adolescent population. We’re here to challenge, encourage, and expose viewers to this mental illness so they have the tools necessary to combat an illness that claims thousands of lives annually. Our mission can’t take effect unless we have the support of everyone in our community. Money allocated to Reel Stories. Real People., Inc. will allow us to educate, inform, and train students who are at-risk of developing an eating disorder. People in our communities, who we’ve known for years, may be secretly suffering from this internal battle. If we don’t face the realities, we may lose them. To stop it, we have to act now and do something immediately. We’re asking for your financial support as we work to raise $200,000 to produce a movie that captures viewers’ attention about this deadly illness. Your donation will assist in material content, writing, producing, casting, shooting, editing, and distribution. The educational film and guided curriculum will be given to school districts nationwide free-of-charge to be used within their public health courses. Together, we can tackle an issue and lead those suffering to a path full of physical, nutritional, psychological, and emotional restoration. Eating disorders have the highest mortality rate of any mental illness, yet they are treatable. For those suffering, their eating disorder is their best friend and their worst enemy. It provides them with the comfort to control, restrict, or gorge on food, while ignoring the emotional and insidious pain that overrules their thoughts. If not properly treated, this mental illness may consume and kill our loved ones. We’re creating an educational film and guided curriculum to assist teachers, so they can have an open discussion about mental health with their students. Most public health textbooks don’t go into depth about this debilitating illness. 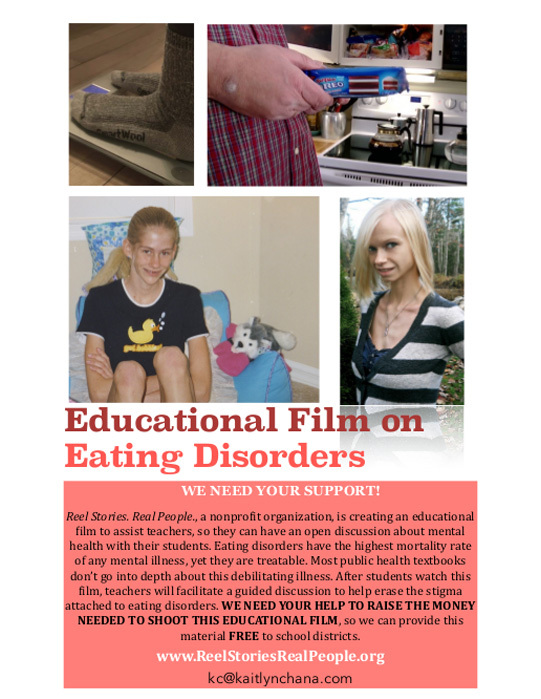 This film will introduce students to three eating disorders that are plaguing our country. Educating people in a dynamic, visually appealing way that includes strong storytelling, which allows people to develop a “well-rounded” base of information on this topic. After students watch this film, teachers will facilitate a guided discussion to help erase the stigma attached to eating disorders. Prevention programs like the one created by Reel Stories. Real People., Inc., can reach a student before the full-blown onset of symptoms. The enhancement resources also provide students with positive reinforcement to encourage them to improve their overall thoughts on their body. By offering help, you can show those suffering how to once again love themselves. Our mission can’t take effect unless we have the support of everyone in our community. We’re asking for your financial support as we work to raise $200,000 to produce a movie that captures viewers’ attention about this deadly illness. Your gift will assist in material content, writing, producing, casting, shooting, editing, and the distribution of this educational film. Eating disorders are a community issue; the only way to solve this problem is by having people take a stand and be informed about the symptoms, behaviors, and recovery methods. People in our communities, who we’ve known for years, are secretly suffering from this internal battle. If we don’t face the realities we may lose them. To end this cycle, we have to act now and do something. To change an outcome, we need people to spearhead awareness campaigns in their communities. We encourage you to start conversations about the unhealthy relationship with food. Learning never ends – it’s important to expose people to the realities of eating disorders. There’s a stigma attached to mental illness, however, the only way to end this is to educate with valuable knowledge. Empowers teachers and students by providing a one-of-a-kind educational film script and guided curriculum that has been backed and celebrated by physicians and psychologists. Constructed the only narrative educational film script regarding eating disorders that is designed to be watched and discussed within a one-block school period. Crafted a story that targets adolescents and catches the viewer with its emotionally charged storyline to broaden the conversation regarding mental health. Developed a malleable, Common Core based curriculum that provides teachers with a variety of proven techniques and activities to create a stimulating conversation and classroom experience. Used digital and social media to craft emotionally-provoking branding for philanthropic organizations to foster interest in their mission statements. Two target populations are critically served by the educational film and guided curriculum that is being developed by Reel Stories. Real People., Inc.: adolescent students and teachers, most notably those who teach public health.If we don’t step in early, students suffering will wilt awayand this illness could claim their life. This would cause an insidious dynamic, as there is one less student in the classroom. There is a vast amount of research to support the need of our target populations. Research indicates that 10-22% of adolescents between the ages of 10 and 18 will suffer from an eating disorder (Keca, 2006; Swanson, Crow, Le Grange, Swendsen, & Merikangas, 2011). These percentages are steadily growing as research is revealing that many more young men and women are suffering from unhealthy eating habits, such as bulimia related behaviors, including vomiting after excessive overeating (Mitchison & Hay, 2014). Many factors are entwined with the steady increase of eating disorders. For example, it is believed that genetics, peer pressure, history of abuse, and other mental health conditions, such as low self-esteem and negative self-image as a result of being taunted or bullied about one’s weight, are also contributing factors (Mitchison & Hay, 2014). These numbers show that adolescents nationwide are in need of early education and intervention if we are to prevent this epidemic from continuing. While the previous research shows that early intervention is a key component of slowing or eradicating eating disorders, one must also note that schools are the front lines of early prevention. To highlight this point, research suggests that eating disorders very often go untreated due to lack of education in schools and home, and is often hidden from educators and parents by youth, which leads to difficulty in detection and diagnosis (Merikangas et al., 2011). 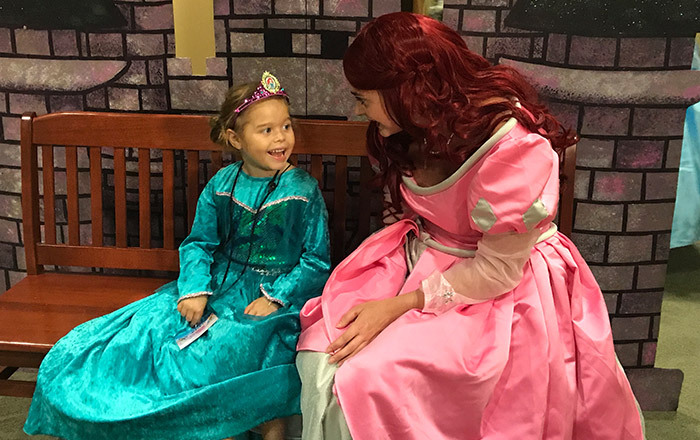 Further medical studies show that concerns about body image begin between the ages of 6 and 12, when children in elementary school start to become concerned with the prospect of weight gain (Smolak, 2011). This problem most often manifests in high school; research geared toward students between the ages of 14 and 19 stipulate that 44% of females and 15% of males attempted to lose weight (Serdula et al., 1993). When the illness goes untreated, there’s evidence supporting that over one half of teenage girls and nearly one third of teenage boys use unhealthy weight control behaviors (Neumark-Sztainer, 2005). Using the knowledge garnered from the previous research, it can be quick for one to put the onus of responsibility on teachers; within the school, however, core subject teachers will look to teachers of public health and coaches for leadership. The fact that public health teachers and coaches must lead this conversation stems from some startling statistics. According to the American Psychological Association, “Eating disorders have been seen in adolescents who are engaged in competitive sports activities such as wrestling, gymnastics, and other sports that emphasize specific body structure and weight requirements” (2014). The majority of the athletes who suffer from eating disorders are women; however, the number of men is growing steadily due to the increasing amount of sports that require men to maintain a specific weight class and physique (Kakaiya, 2008). Using our knowledge of the symbiotic relationship between eating disorders and sport shows the immense need for public health teachers to take the leadon this pressing issue.